You have got a new Android smart phone and want to ditch the old iPhone? Or you have got an additional number which you want to move to an Android from iOS device? In both cases, your journey needs to be smooth. If you are worried about selecting the right tool for switching from iOS to Android, we have got you covered.If any of your friends ask you 'should I switch from iPhone to Android? ', you can tell them that they can. In this article, we have compiled a set of solutions to make your job easier. Keep reading to explore more! You can use SamsungSmart Switch for iOS to Android, in order to make a smooth transition. In this aspect, you need to have an OTG cable as well as your iOS device's USB cable. Without these 2 it is bit tough to switch from an iOS to an Android phone through Smart Switch app. First, install the Smart Switch app on both your iPhone and Samsung device. Launch the Smart Switch app on your iPhone and Samsung device. And then, tap 'Wireless' option from the main screen window. On your Samsung device, you now need to connect with your old device, i.e. iPhone. Therefore, you need to go for the 'iOS' option and let both the devices to get connected. After that choose the desired data that you want to migrate from your iPhone and click the 'Send' button on your iPhone. You will be recommended to install similar apps, once the transfer process gets over. Now that you have learnt how to switch from iPhone to Android, how about knowing the other way around.Well, Move to iOS app from Apple is an effective method in this regard. Within few simple steps, you can automatically move data from Android to iPhone easily. Message history, camera photos and videos, contacts, web bookmarks, calendars etc. are the supported file types that you can migrate to iPhone using Move to iOS. Download and launch Move to iOS on your Android phone. Now, tap 'Continue' and then 'Agree' to move ahead. On your new iPhone, set up the passcode, language, touch ID and connect the iPhone to Wi-Fi. Go to 'Apps & Data' and then hit 'Move Data from Android'. Click 'Continue' on your iPhone and you will view a code displayed there. Now, get the Android phone and enter the code when prompted. Now, both the devices are connected over the same Wi-Fi. Choose the preferred data and click 'Next'. On your Android phone tap 'Done' once the transfer of data is complete. Let the iPhone sync with all the transferred data and then set up the iCloud account. The transferred data can now be available on your iPhone. After you have been through the process of switching from iPhone to Android and Android to iOS, here we have something different for you. What if, you have an old iPhone and want to move to a new one without much hassle? For such scenarios Tenorshare iTransGo is an ultimate solution. The tool enables you transfer data between iOS devices with a single click and is compatible with the latest iOS. Apart from that you can directly copy and migrate files selectively among iOS devices. It allows you to share purchased music between other Apple IDs. Step 1: Install Tenorshare iTransGo on your computer and launch it afterwards. Using a USB cable get your iPhones connected to your PC. Step 2: On iTransGo interface, tap 'Next' and then mark the old iPhone as the source device. The software starts analyzing the source device content instantly. Step 3: Now, you need to choose whatever data you want to move from old to new iPhone. Alternatively, you can tap 'Select All' and hit the 'Start Transfer' button. all the data gets transferred to the new iPhone within few minutes. When it comes to switching mobile devices moving data is a pain in the neck. But, for iOS to iOS switching we would highly recommend you to pick Tenorshare iTransGo. 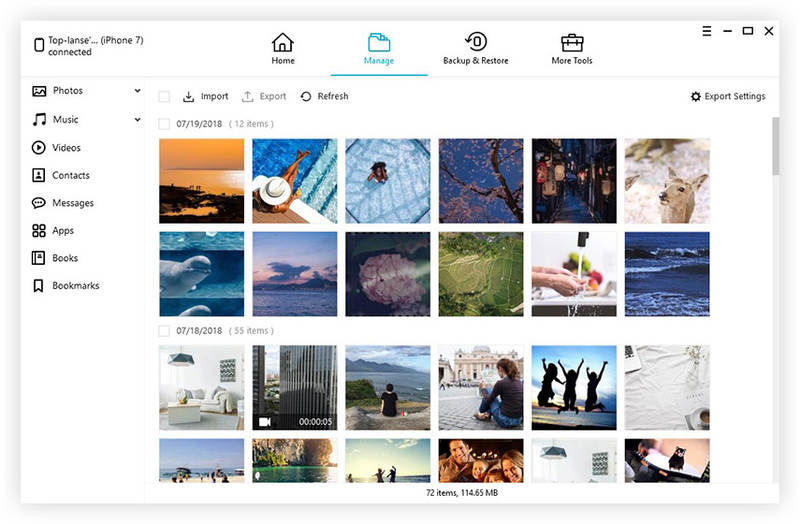 With this software, you don't run the risk of losing data accidentally during transfer. The best part is, it offers you the privilege of sharing purchased music among different Apple IDs.